And so starts Beastie Boys Story, a deep dive two-man exploration of the complete history of the seminal hip-hop trio starring Diamond and Horovitz, with direction by Spike Jonze, where the life of the band is brought to vivid detail both on and off-stage. That includes the ring tale, complete with sets mimicking the moment Horovitz was given the ring and that fateful train ride. First staged in Philadelphia and finishing its recent run at Brooklyn’s ornate Kings Theatre, the show is based around last year’s Beastie Boys Book and verges on four hours long. As such, it’s designed to be the ultimate telling of how three friends growing up in the dilapidated New York City of the 70s and 80s became iconic parts of the pop culture landscape. 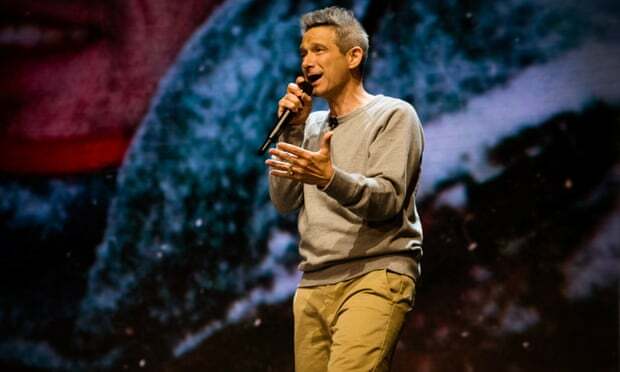 Using pictures, clips and audio projected behind Diamond and Horovitz, at its purest form Beastie Boys Story is an innovative extrapolation of the idea of a two-man show, and at its weakest amounts to a rather fun PowerPoint presentation.